Occupational therapy (OT) is a skilled intervention that works with children of all ages, along with their families, to facilitate participation and independence in all of their daily life activities. The primary “occupations” of a child are self-care, play, social interaction, and school participation. Occupations are made up of all the small activities in between, including safely moving your body, following directions, transitioning between activities, and remaining calm, that enable children to develop life skills, learn, be creative, find enjoyment, and thrive! What makes Occupational Therapy unique? Occupational therapists utilize a knowledge base of anatomy, physiology, neurology, psychology, sensory processing, and motor development in order to analyze tasks and activities that children are having difficulty with. We specialize in breaking down the activity into component parts and identifying the areas of strength and weakness in order to address the skills and areas of concern. When can Occupational Therapy help? A child may benefit from OT when they have difficulty participating in day to day activities at home, school, or out in the community. 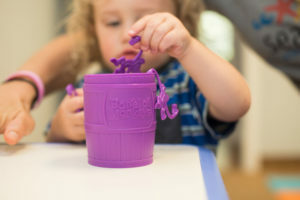 These difficulties may be the result of developmental delays, acquired injuries, or challenges with sensory processing and/or emotional-behavioral regulation. 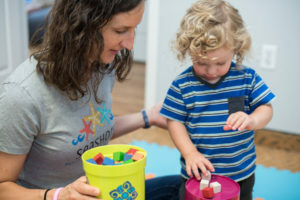 Occupational therapists assess and utilize individualized interventions to help children develop and refine sensory processing and motor-based skills in order to allow for increased success with educational performance, independent self-care, happy relationships with others, and fun and safe exploration of their environment. Our occupational therapists use a play-based approach to create an environment rich in sensorimotor opportunities, where your child will have fun participating in activities that develop their areas of weakness. What looks like your child swinging, jumping, climbing, and playing are intentional activities designed to improve underlying sensory processing, strength, balance, coordination, and overall motor planning. Interventions and sessions are always focused on skills that are valued and beneficial to meet the needs of your child and family. Most importantly, involvement and education of the parents/guardians is a priority to ensure carryover when and where it really matters… at home and school with a child’s family and friends! Open Daily! Please Call for an Appointment.